Phoenix International Raceway is home to NASCAR Sprint Cup, NASCAR Nationwide Series, NASCAR Craftsman Truck Series and the NASCAR Camping World Series. 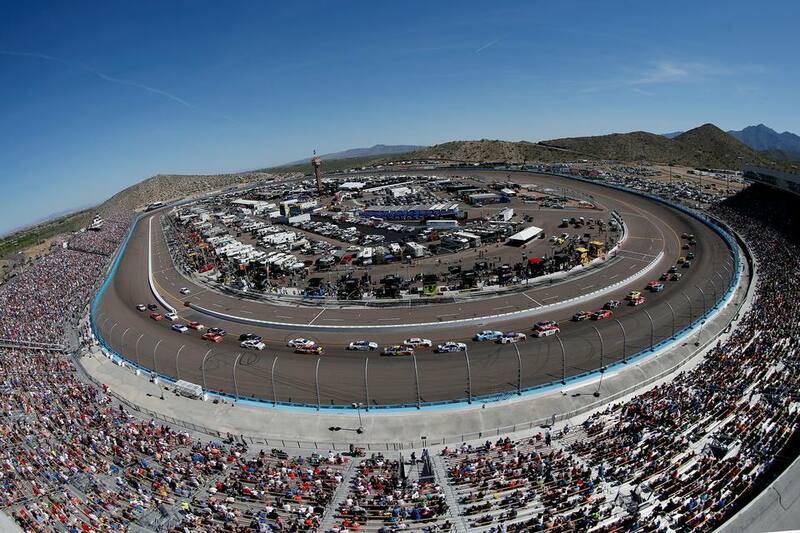 In both the fall and the spring, NASCAR fans flock to Phoenix to catch the action. Where is Phoenix International Raceway, or PIR? The actual address of PIR is 7602 S. Avondale Blvd., Avondale, AZ 85323. Here's a map and directions to Phoenix International Raceway. There is no public transportation that gets you to Phoenix International Raceway. You have to drive. This venue is not accessible by Valley Metro Rail. Special directions for driving/parking are below. The Arizona Department of Transportation usually provides detailed motorist information, including any travel or road restrictions, for NASCAR at PIR. Call 5-1-1, then *7. The call is free. 1. At the PIR Box Office, located at 125 S. Avondale Blvd. Suite 200 in Avondale. The phone number is 866-408-RACE (7223). 2. Tickets can be purchased at the track during race weekends at the Ticket Offices at Gates 3 and 7. General admission for adults to Grandstands on Pole Day start at about $20, less for kids. On Saturday, tickets start at about $40. For the main event on Sunday, prices range from about $10 to $120 per adult ticket. Pre-race pit passes and package deals are available. Local sponsors, like Casino Arizona, may offer special savings on tickets and packages. Here is the detailed schedule of events for the next NASCAR event at PIR. There are strict rules about what you can bring into PIR, what gates are used for which purposes, and what happens at the various parts of the track. one small soft bag (purse, cooler, whatever) is allowed. cameras are allowed but photos taken may not be used for commercial purposes. seating is grass only on Hillside. Bring a chair or blanket. most practice and qualifying days are general admission. Traffic can be a challenge on NASCAR days. Be early, and be patient. NASCAR is the acronym for the National Association for Stock Car Auto Racing. There are various series of races and drivers/teams accumulate points in the standings. For instance, in the NASCAR Winston Cup Series, there are more than 30 scheduled races throughout the year. Likewise in the NASCAR Busch Series. The horsepower of the vehicles varies from series to series. Some NASCAR drivers compete in every race in the series, and races take place at tracks all over the country. What is Phoenix International Raceway like? Phoenix International Raceway, or "PIR," is located in the southwest part of the Valley at the base of the Estrella Mountains. It is a one mile paved oval on a 650 acre facility. It seats 78,000 people and is operated by the same company that operates the Daytona International Speedway. When NASCAR comes to Phoenix International Raceway ("PIR") all regular traffic flows and patterns are dramatically altered. In order to get tens of thousands of race fans in and out of the area as quickly as possible, the Maricopa County Department of Transportation, in association with the Arizona Department of Transportation and the various communities impacted by the traffic, provide these tips for people attending NASCAR events. From time to time during fall events the Arizona Cardinals football team might also be playing at home on Sunday at the University of Phoenix Stadium, making traffic flow on the west side of town especially challenging. Fans driving their own vehicles to the track should remember that their type of ticket determines the exits they should take from I-10 to the race. Fans with general admission tickets must take either Litchfield Road (Exit 128) or Estrella Parkway (Exit 126). Fans with special passes and permits should use Avondale Boulevard (Exit 131). If you take the wrong route you could face major delays as you approach PIR. Traffic information for race fans, including updates, will be available on the ADOT phone system. Fans should use it before leaving for the track and before heading home. The 5-1-1 system will be continually updated from 7 a.m. until at least two hours after each race on Thursday, Friday and Saturday. Out of town NASCAR fans arriving at Sky Harbor Airport and renting vehicles will be able to see special messages about traffic in and around PIR on the video monitors in the Rental Car Center during the race weekend. Park 'n' Ride Lot: I-10 to 83rd Avenue, Exit 135. This is about two miles east of the I-10/101 Interchange. Special Passes and Permits: Exit 131, Avondale Boulevard. Go south approximately six miles to the entrance to the parking lot. General Admission, Eastbound: Exit 126, Estrella Parkway. Go south approximately five miles to Vineyard Road. Follow the signs and directions from officers and deputies as you go east about three miles to the entrance to the parking lot. General Admission, Westbound: Exit 128, Litchfield Road, or Exit 126, Estrella Parkway. Go south approximately five miles to Vineyard Road. Follow the signs and directions from officers and deputies as depending on traffic flow you may be diverted for a short time onto MC85 or Broadway Road. Once you reach Vineyard you will go east about two miles to the entrance to the parking lot. Notwithstanding any of these instructions, motorists must always follow the directions of officers and deputies. Any changes to these routes will be updated immediately on 5-1-1. Be patient, and leave plenty of time. Where do people stay nearby? PIR has RV parking which is right next to the track. Call 1-866-408-7223 for reservations. There are showers and restrooms and a general store. More about PIR RVs and camping. Check the Better Business Bureau for other RV Parks. Search for 'RV Parks' and then zip code. Use the zip code 85253 to search, and then filter for distance. Check the nearest cities on the west side of the greater Phoenix area: Avondale, Goodyear, Litchfield Park, Buckeye, Phoenix, Glendale, Peoria, Surprise. Phone numbers with 623 or 602 area codes will be the closest. Area code 480 will be Scottsdale or the East Valley (Tempe, Mesa, Chandler, Gilbert, Apache Junction, Queen Creek) and will be a bit farther away from PIR. If you are looking for a place to stay in the area, check TripAdvisor for the hotels closest to PIR. I'm so glad you asked. When there's a break in the NASCAR action, there's lots more to see. Check out these sections on area attractions including casinos, sports, festivals and events, and concerts and shows. In March, don't forget Spring Training Baseball takes place at ten stadiums in Greater Phoenix. There's so much to do and so little time! For more information, contact the Phoenix International Raceway at 1-866-408-7223 or visit Phoenix International Raceway online .